I was hoping that Summit Dog Rescue could possibly help me out. I adopted the most kind, adorable, and sweet dog at the beginning of this year. Unfortunately over the past 6 or 7 months as her personality has truly started to come through I came to the heart-breaking realization that I may not be the right owner for her and that she could be so much happier somewhere else. So, I am unfortunately looking to he-home her. 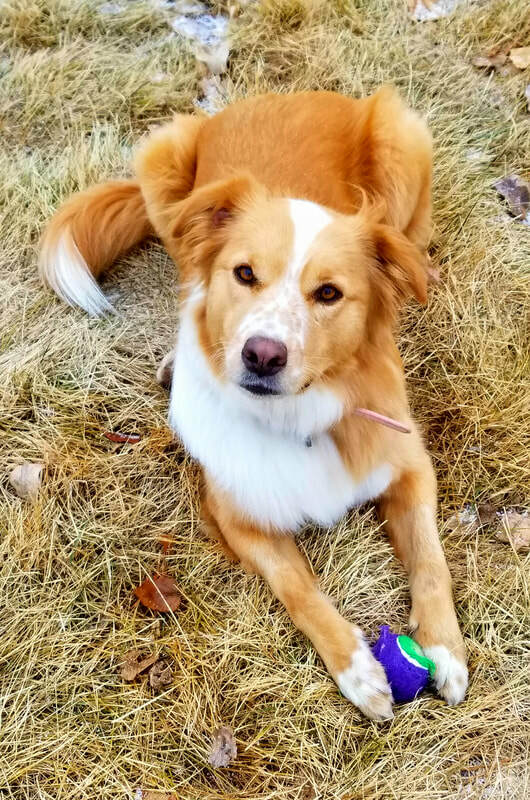 Sky is a 2.5 year old Australian Shepherd- Golden Retriever mix. She is highly intelligent and has had extensive training. I adopted Sky on Dec 30, 2016 from Foothills Animal Shelter. She was previously abused and kept only in a fenced in back yard for the first two years of her life without exposure to anything. She ended up running away and getting hit by a car which is how she ended up in the shelter. Her previous owners did not want her back and surrendered her. Naturally when I first got her she was extremely shy and anxious but I was assured that with training, love, and time she would settle in and relax. I immediately started individual in home training to help get her more comfortable in her new environment. She picked up on new tricks and commands so fast but her anxiety did not lessen. She knows sit, down, wait, stay, leave it, paw, come, heel both on and off leash. I have since tried individual training in multiple locations, group training, overnight training, massage, calming supplements, all natural grain-free dehydrated food, and now medication. She is just still so anxious and even displays many signs of depression every time she is home. However, when we do go outside and hike, or play catch, or run around, or she is able to explore, she is so happy and goofy and excited. She needs to be able to run around like that every day in a big backyard. Unfortunately I live in an apartment and will continue to do so for quite a while. Now between boarding fees, special food, medication, training, and other normal dog expenses I am in way over my head. Sky needs a big yard and maybe even an older dog brother to play with and a family that will be home every day to take her on hikes and to the park to play fetch (I am a nurse and work 12 hour shifts 3 days in a row and have to board her on those days because she won't leave my apartment with a dog walker). All I have ever wanted since the day I got her was for her to be happy and to have a great life. I wanted to wait at least six months so she had time to fully adjust to her new home, but I just feel deep down that she has the potential to be so much happier.